Reading- We have been talking about character traits and how we can describe a character in a story based on their words and actions. We have started reading The Lion, The Witch, and The Wardrobe for our class read aloud and the kids love it so far! We have also started meeting with small reading groups, and are so excited to read some new books. 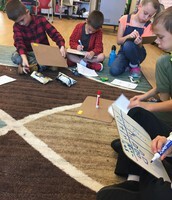 Math- We have been continuing with addition and subtraction with regrouping. Students seem to be doing well with addition, but we are still struggling a bit with subtraction. We will continue working on this skill. We will plan to have a post test on this unit on October 11th. Genius Hour- This week we worked on generating thick questions to begin our research. We also gathered books on our topics and will begin researching next week. Students seem really excited about their projects thus far. If you're interested in volunteering to help with Genius Hour, you can view the link here. Writing- This week we started talking about a personal narrative and we will continue to generate ideas for a personal narrative your child would like to write. The plan is to have students write several personal narratives, and choose which one they'd like to publish at the end of the unit. Many of you have asked about spelling assessments and what they will look like for your child. We have split the class into 2 groups based on a spelling assessment that we gave early last week. Some students will be learning FUNdations with Mrs. Callahan, and other students will do a program called Word Journeys with Miss Pratt. This will help us differentiate learning for students based on their current needs. How can I help my child increase their vocabulary? Use new and interesting words in natural conversation. Try this at mealtimes. Visuals also help children learn new words. Studies have shown that students who are exposed to more "rare words" at home, have a higher vocabulary. Read to them- research shows kids learn new words from books! Encourage children to look up new, unknown words when they come to them in reading. Relate new words to known words- use of synonyms (words with the same meaning). Example: frustrated is related to the word mad. Expose children to words multiple times! Click here to read an article on increasing student vocabulary. MobyMax: This is an awesome resource for math and reading. Students can earn game time as they work through lessons. All lessons are tailored to meet your child's individual needs based on a pretest they took. Students earn classroom money when they earn a badge. THE SCHOOL CODE IS OH2407 you can go to www.mobymax.com/oh2407 To log in: Students' usernames will be the same as their google account. For example, mine is pratt.3. The password for all students is eagles3! Please be sure your child is bringing a healthy snack to eat during the day. We have snack time around 11:00, and our lunch isn't until 12:35. We have several students who are not bringing a snack daily. We have a limited amount of snacks to give away away for our SLC. 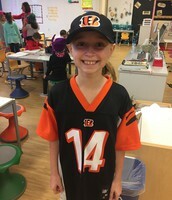 Students loved spirit week! 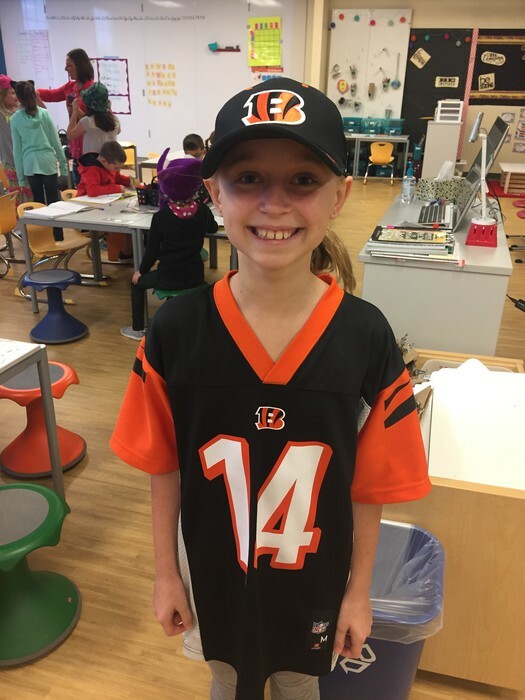 You may think this was worn on "Favorite Team day", but Gracyn continued to show her team spirit even on "hat day!" 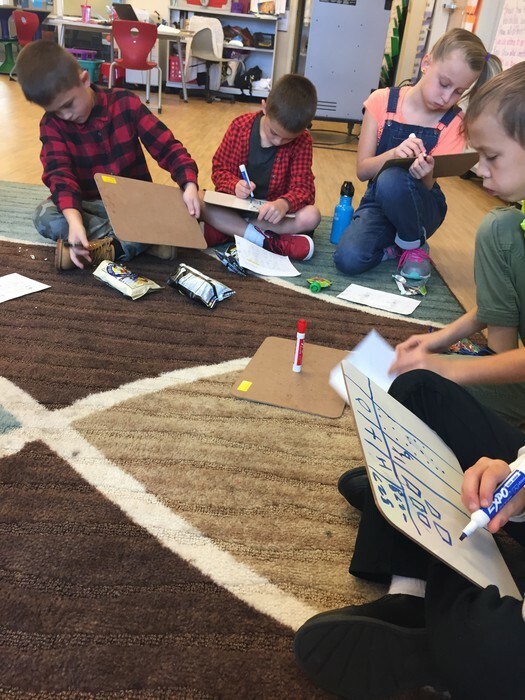 Students work in small groups to review addition and subtraction. 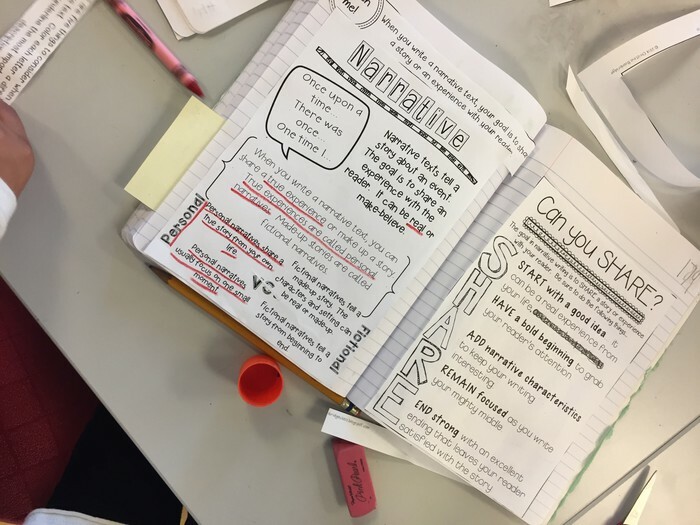 Students add information to the "mini lessons" section of their Writer's Notebook to help them remember the characteristics of a personal narrative.